Serenity Now: Scentsy Holiday Warmer and Scent Giveaway! Today, one of my newest sponsors, Theresa from Scentsy is going to give away a full-size holiday warmer and a bar of the Christmas Cottage scent! Keep reading to learn more about Scentsy and to get details on entering! Most of you know that I can't smell (ever! ), but I love to keep candles and yummy smelling stuff in my house because I know everyone else enjoys it. What better way to welcome friends and family into your home over the upcoming holidays than to entice their senses with great smells? 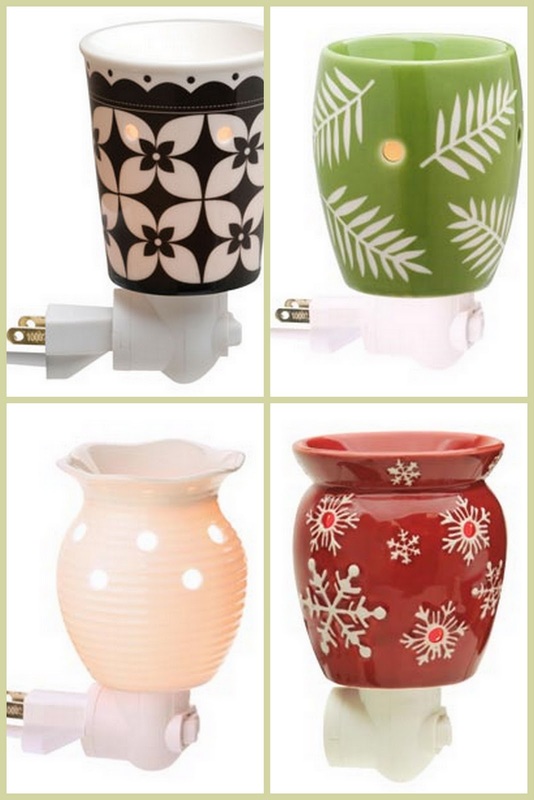 If you're not familiar with Scentsy, it is unique because the product is a wickless, flameless, and smokeless candle. 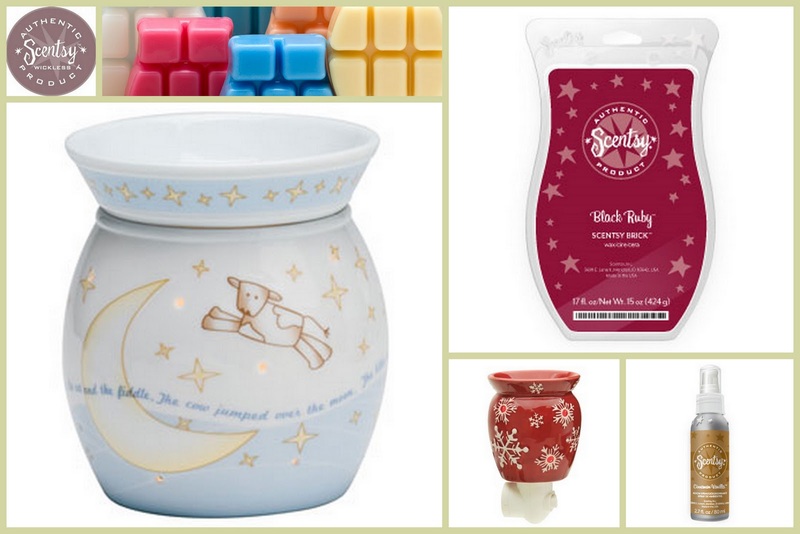 The warmers use a low-watt bulb to melt specially formulated wax that releases a fabulous fragrance. I own two Scentsy warmers and my husband loves when I switch them on because they truly do fill our rooms without being overpowering to his senses! The neat part is that you only have to change out the wax and not the whole candle. 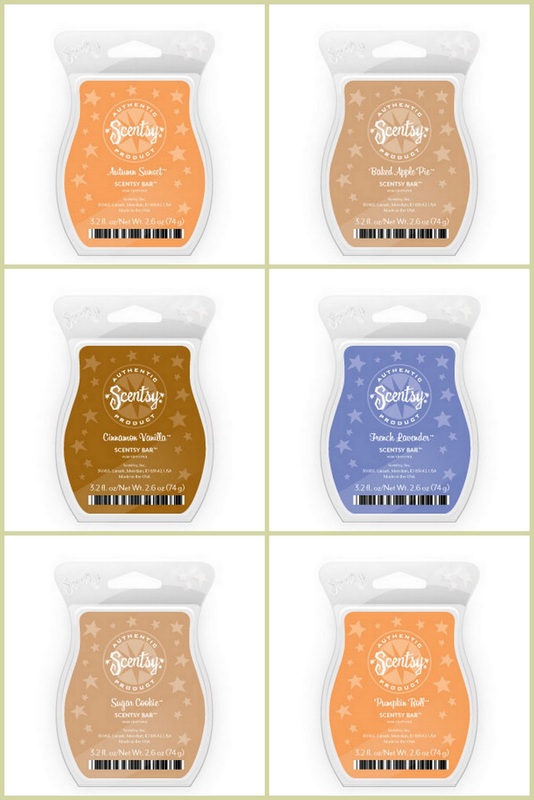 The warmers use special Scentsy bars...you break off what you need and save the rest. They have over 80 scents! Some of the most popular fall and winter scents include Autumn Sunset (for the cinnamon), Pumpkin Roll (for pumpkin with a hint of cinnamon), and Christmas Cottage (for the peppermint). Is anyone else hungry now? One of my personal favorite Scentsy products is my plug-in warmer (I own the Groovy white). These are great for kitchens and bathrooms, especially if you don't have a lot of counter space! 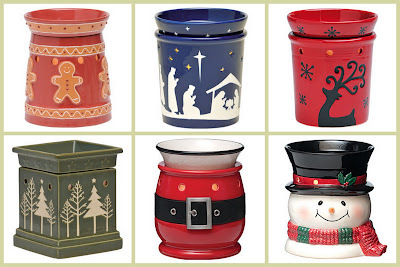 I love that the full-size warmers also include a holiday line...how cute is the Santa? With Christmas just 72 days away (??! 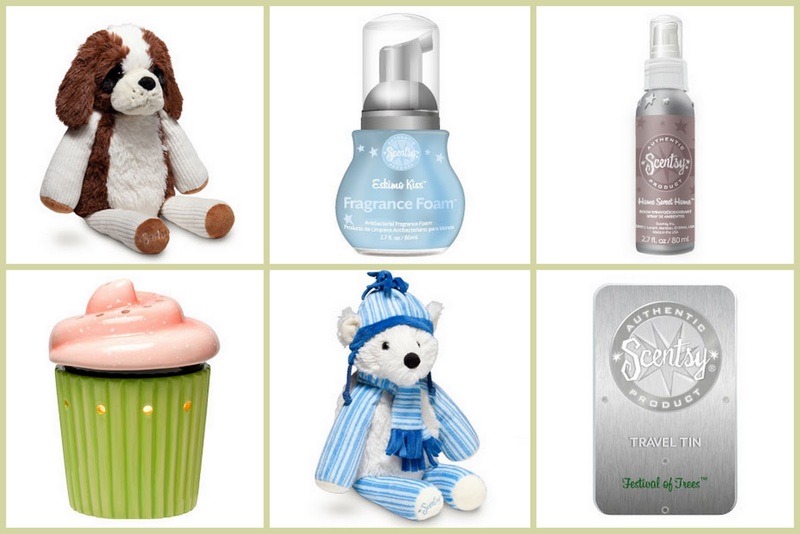 ), shopping in Theresa's online Scentsy shop can help you knock out some of those gifts on your to-buy list. Orders placed online usually arrive in 7 to 10 days...ordering before December 10th is recommended to guarantee Christmas delivery. Theresa joined Scentsy as a consultant in July of 2010, after making several purchases for herself and her family. Her decision was made after seeing the simplicity of the products and the fact that consultants receive a lot of start-up items for a cost lower than many other direct sales companies. She enjoys setting her own hours and says that everything a new consultant would need is included in the starter kit. This is a great time to earn some extra Christmas cash! Another way to earn a few extra products for yourself is to consider hosting a Basket Party to earn free and half price Scentsy products! 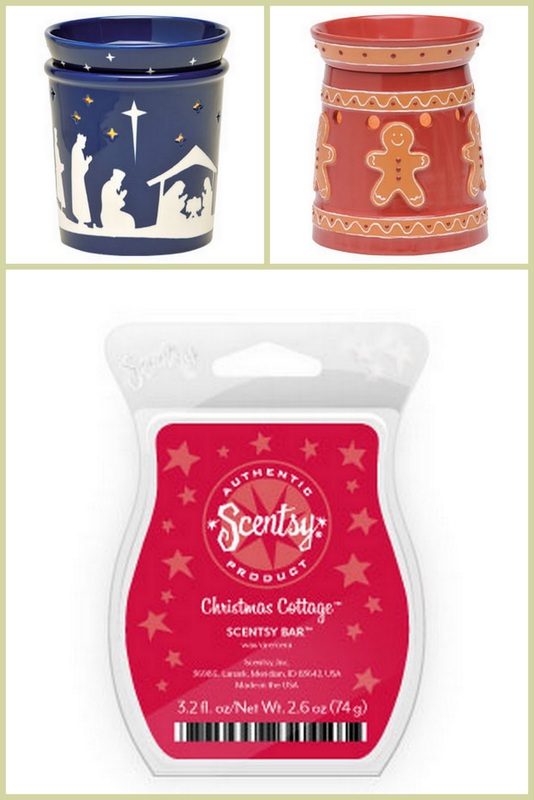 *Silent Night or Gingerbread Warmer and a bar of the Christmas Cottage scent! 1. Visit Theresa's online Scentsy shop and leave me a comment here with the name of the scent you'd most like to test out! 4. Join my Weekend Bloggy Reading party this weekend and include a link back to my blog within your post for an extra automatic entry! Giveaway open until Sunday, 10/16, at 10 pm ET. Open to US residents only. Baked Apple Pie sounds delish!!! Graet giveaway! Thanks for sharing! I love, light & airy scents (mainly b/c the food scented ones would probably have me eating all day! Haha!) I'd love to try the just breathe scent in the spa collection. I love all of the Fall-ish scents! I want to try them all. All of the fall/winter scents sound good. I'd like to try the Festival of Trees...thinking that might give the scent of a real Christmas tree in the room (we miss that with our artificial tree). I usually go with Vanilla but lately I want a musk kind of smell. Wonder which one that would be? Too bad we can't smell through the screen. lol. Thanks so much for the chance. I would love to smell the Pumpkin Roll...that type of scent always reminds me it Fall which is my favorite time of the year!! Hmmm. I think Cinnamon Vanilla would smell amazing! Shared your link and giveaway on Facebook! i like the home sweet home!! I would love to try the Pumpkin Roll and Honey Pear Cider. They both sound delish! I am going to post a link to this on my FB page. Thanks! i bet the hazelnut latte one would smell fantastic. i was given a scentsy and i love it! great giveaway. I would love to try the Black Raspberry Vanilla Scentsy Bar! Cinnamon Vanilla sounds really good to me! Oooo, fun! I have, of course, heard of Scentsy, but never tried it. I like the sound of Autumn Sunset. Clove and Cinnamon seems so fall/Christmasy that I'd like to try that one. Oh... Black raspberry vanilla please!!!!! Baked Apple Pie, wouldn't love this yummy scent! mmmm the cinnamon vanilla sounds soooo good!! Autumn sunset--sounds like it would be wonderful. I joined the Weekend Bloggy Reading Party. 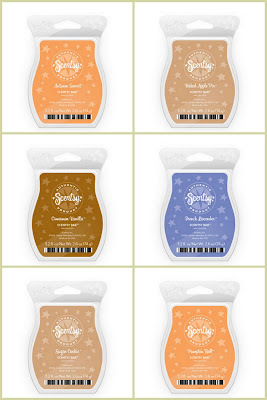 The Autumn Sunset Scentsy Bar sounds AMAZING! Would love to try Pumpkin Roll! I'd love to try blueberry cheesecake!